I started doing this last year. It works exceptionally well for us. We store our toyhauler out of town and near to where we usually camp. So I can't just fill the fresh water tank with the garden hose at home like some of you. So to find a place to get water in the desert or mountains had been a challenge. Most places charge $10 for 50 gallons once you find them. And I refuse to get water from a dump station hose. So, after researching getting a 50 to 100 gal tank to fit in my truck bed, I didn't like the cost or the idea of having this massive tank in my truck all the time. That was a no go. So, I bought 15, 5 gallon buckets w lids at the orange home store. Cost about $80 total, collapse into a small space inside each other when empty. I also bought a Ryobi cordless transfer pump for about $80 as well. And a 30 foot hose that I attach the water filter to when filling the trailer. I fill the buckets while in place in the truck before leaving the house. I empty the buckets in place in the truck and stack them as I empty them. I never have to carry heavy buckets or cans. So. For less than $200, I dont have to worry about water again. Sure, they aren't airtight, and can leak a little, but water sitting a few days in the buckets and then run thru a filter seems fine. Disclaimer... we don't drink the water, just use it to wash dishes, shower, flush toilet, etc. I would not recommend drinking the water carried this way. Everything written by this author is not claimed to be fact nor fiction and may be considered seriously altered depending on the libation being consumed at time of writ. 2012 FR Stealth 2714 Toyhauler. 2017 Ford F 250, 4x4, Super Cab, 8' bed, 6.2 gas motor. Various Desert Toys including a Rzr XP Turbo. I use those orange buckets when brining turkeys for Thanksgiving. But I've often worried a little that they are not food safe, but talk myself into not worrying a about it, being the food will only be in there for 12 hours. For extra water, I use Reliance brand food safe 10g tanks. Problem is, they do not nest in each other like your brilliant bucket idea. Being that it is not drinking water, I guess it is a moot point. But you said you transfer the water to your potable water system, which I plan to drink from. I use those orange buckets when brining turkeys for Thanksgiving. But I've often worried a little that they are not food safe, but talk myself into not worrying a about it, being the food will only be in there for 12 hours. Buy the 5 gallon brining bags. They fit into the buckets and are food safe, and make cleanup much easier. ADVtraveller, did you ever look into those water bladders that fit in the bed your truck? 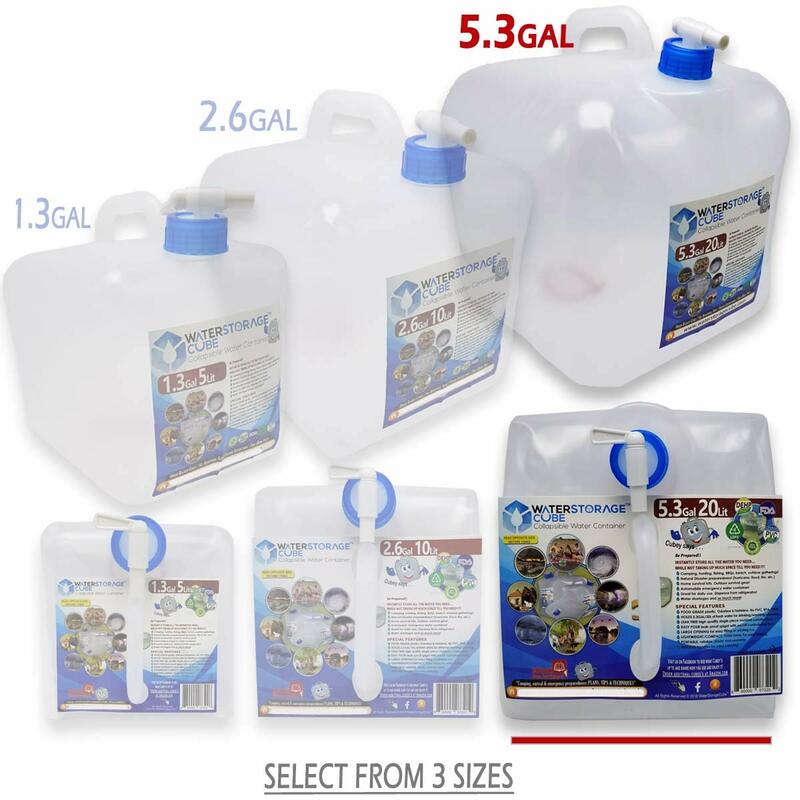 Collapsible 5-gallon water containers. Come in sizes from 1.3 gallons to 5.3 gallons. They are cube shaped and waste less room than round buckets. Can store them in any spare space. Each 5 gal container weighs just over 40 lbs so if you have to move weight around for proper load balance in TV or TT, this is an easy way to do so. If you carry in the pickup bed along with items that might puncture them just build a wood box that fits across the bed and holds a row or two of them. These "cubes" also come with a pour spout so you can more easily pour int the gravity fill port on your tank or even just put on on the counter for Kitchen use (great if water system is winterized). Cubes can also be filled from drinking water dispensers in grocery store, etc. Different styles with different materials available with prices running from $7-$10, depending. Also available are molded plastic water carriers much like "jerry cans" used for gasoline/diesel. Much more durable but also more expensive. Remember, bladders need a method of transferring water to the TT's tank. Add cost of pump. I did. I like them. Thank you for the heads up. I'm just sharing a cheap easy way to carry non potable water. The jury is still out on those bladders in my house as I always manage to break things that are even a little bit fragile. Whether those bladders are fragile and durable enuf for me has yet to be proven. They may be the better way to go. But seriously, potable water is only as potable as the method one uses to get it into the fresh water tank. Most use a hose of some form. Which typically, is rated non potable unless it's a fixed hose. And it's done either thru a transfer pump or siphon, neither of which are 'food grade'. If there is a hose bib/hydrant from a potable source I would use my own hose. The white RV hoses are "food grade". Also, if you are uncertain of the water source you could just add the recommended amount of Chlorox to the "bladder" and then let your vehicle filter remove the taste as you pump it through the TT's water system. A good reason to leave the onboard filter where it is if the TT came with one. Visit the Chlorox website and they list the amount of chlorox to add to drinking water if unsure of source. BTW, for those who have large water transport bladders and their TT has a winterizing port, just run your regular hose from the Anti-freeze port, turn the valve from tank to port, and connect other end of the hose to the bladder. Water pump will now draw water from the bladder. May have to make an adapter to connect to bladder for hose. If you want water in the tank, make a hose adapter for the outside shower and run second hose to tank fill. Open cold faucet and turn on pump. Why not buy a one hundred gallon air bladder tank, I think there are called pillow tanks. Husky Portable Containment tanks makes them any size you want. When all the water is out they fold up really small.